This great burger concept has operated for 18 months with consistently strong sales and now are over the $40,000 a month mark growing. The owner just added a liquor license and sales should show more growth as the word gets out. The reason for success is simple...great product, clean restaurant, good prices and great service. Now you can take over this burger business and continue the success at a low price for a store generating good profit. THE MONEY MAKER: Speaking of profit, using the profit for the past seven months, this store should earn about $100,000 working owner cash flow and about $65,000 Absentee operated cash flow this year. The Buyer needs to perform a thorough due diligence. The books and records appear to be clean as the operator is meticulous about his books. 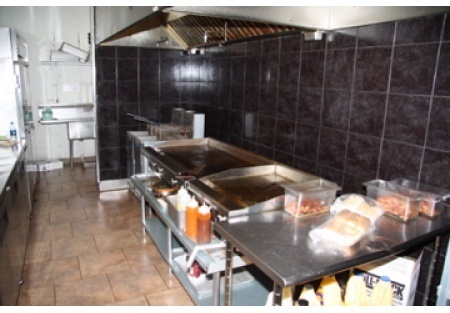 KITCHEN: The store is in great condition with a nice kitchen that can be viewed from the dining area, giving the customers confidence that the product is being handled well. VIDEO: We have a video of this business. Just go to SellingRestaurants . com and search for listing 4134 and select the red button “More Photos.” Go through the process and you’ll see the nice video. EMPLOYEES: All the employees stay as well as the general manager, but that’s up to whether you want them or whether they want to stay. But they’re all trained! LEASE: Lease has 2 years left plus a 5-year option. The total rent including NNN/CAM is about $3,850 per month. Sq. Ft. is 1,800 inside plus a small outside patio area in front of the restaurant. Alcohol License Just Put Into Store! Sales Will Increase!